The Media: Connect for DLNA and UPnP media streaming application serves both as a media server and a network media player which allows you to stream, view, or download digital media files to your iOS device from your other DLNA® or UPnP™ certified devices and vice versa. The Media: Connect for DLNA and UPnP media streaming application is available in iTunes and can be downloaded to an iPhone®, iPod® touch, and iPad® with an iOS version 6.0 or higher. NOTE: This application can be downloaded for free. To take full advantage of its functionalities including the capability to stream or view more than three (3) network shared and local files, you need to purchase the paid version. Media server – The Media: Connect for DLNA and UPnP media streaming application allows you to stream digital media files found on your iOS device directly on your other DLNA® certified or UPnP™ clients such as Windows 7 computers with Windows Media Player, DLNA® Blu-ray players, WDTV® Live, DirecTV® HD DVRs and a lot more. Mobile Digital Media Controller (M-DMC) – This capability allows you to wirelessly control the playback of digital media files on your DLNA® certified or UPnP™ clients using your iOS device. Aside from that, this application also lets you route digital media content from other media servers to other DLNA® and UPnP® clients. NOTE: Other video formats can be streamed via the integrated flex: player. AAC, MP3, Apple Lossless (ALAC), WAV, and FLAC. Download digital media content to your iOS – This application lets you download network shared digital media files from media servers found in your network so you can view or stream them on the go. This tab allows you to view and browse through media servers currently connected to your network for digital media files you want to view or stream. To view or playback digital media content, simply tap on a media server and navigate through the folders to find the media content you want to view or stream. Client Manager – This allows you to enable or disable client access to your iOS device. To enable or disable access to your iOS device, toggle the ON/OFF switch beside the device you want to enable or disable access from. Content Manager – This section allows you to delete files from the “persona: library” which contains files you have downloaded to your iOS device using the Downloader feature of this application. Media Renderers – This contains the media rendering clients where you can playback downloaded digital media contents to. You can use this feature to control playback functions, such as volume, play, pause, stop, rewind and fast forward, of the media renderer using your iOS device. Content Directories – This allows you to select digital media contents to stream on a media rendering client. When you select a digital media content, you will also be prompted to select a media renderer where you want to view or stream your media files. Download Content – This allow you to select a digital media file to download to the “persona: library”, which also contains the other files downloaded to your iOS device using this application. Download Mananger – This section allows you to view the progress of a download or downloads. It also allows you to re-order or cancel downloads. 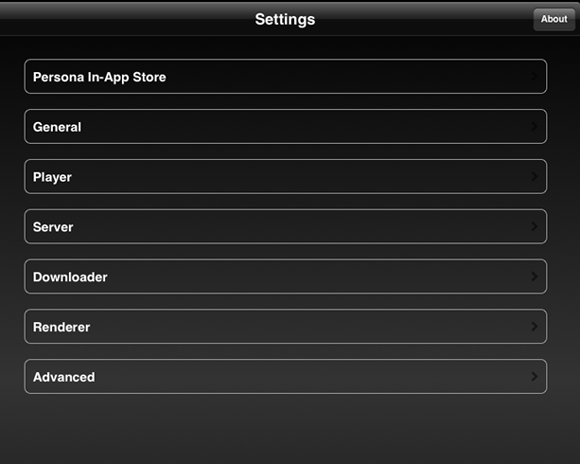 Persona In-App Store – This section gives you the option to purchase the full version of this application. General – This section allows you to enable scaling of the Album Artworks of the music files you are playing back. Player – This section allows you to make necessary adjustments to the Audio playback and Image thumbnail view. Server – This section allows you to reset the “persona: library”, as well as enable or disable automatic connection of new clients to your iOS device. Downloader – This section allows you to select and manage a downloader profile. A Downloader Profile sets which file formats you can download to your mobile digital media server (M-DMS). Renderer – This section allows you to enable or disable the capability which lets your iOS device to be remotely controlled by another digital media controller. Using a Digital Media Controller (DMC) or Mobile Digital Media Controller (M-DMC), you can remotely send supported music, video and image files to your iOS device for playback. Debug Mode – Enabling this setting will generate detailed logging for support purposes. Restore In-App Purchases – Tapping Restore will restore your previous In-App purchases for the Media: Connect application. Local Notifications – Enabling this setting allows Media: Connect to prompt local notifications while it is running in the background. Badges – Enabling this setting will show badges which indicate the potential compatibility of media resources on the media server, based on the supported media file formats of the player.